Gordon, Neb. (May 4, 2015) – Cody Darnell is comfortable not only on the back of a horse, at a rodeo, but in front of a crowd, singing a solo. The Gordon, Neb. youth has been a cowboy since he was old enough to follow in his mom and dad’s footsteps, but just this year, due to the urging of his high school music teacher, he took the lead in the Gordon-Rushville High School musical. It was a new role for him. After Mr. Ryan Lovell, his choir teacher, realized he could sing after his first year in choir, he convinced Cody to audition for all-state choir. “After I made that,” Cody said, “he gave me a solo for the Christmas concert.” It was the first time he sang a solo in front of a crowd. And after that, Mr. Lovell was sure Cody could handle the lead role for “Seven Brides for Seven Brothers.” So he took that part, which required him to sing several solos and memorize his lines. The only disadvantage to the musical was the time it required for practices. Cody usually practices his tie-down and team roping six nights a week, but with musical practice beginning in March and running through the end of April, his roping was limited. In the winter months, he and his sister Morgan rope at a neighbor’s barn six miles down the road. His diligence has paid off. He has qualified for the Nebraska High School Finals Rodeo his freshman and sophomore years, and last year, finished in fourth place in both the tie-down and team roping to go on to the National High School Finals Rodeo in Rock Springs, Wyo., where he finished the year third in the nation in the tie-down roping. In the team roping, he is the header for Riley Wakefield of O’Neill. 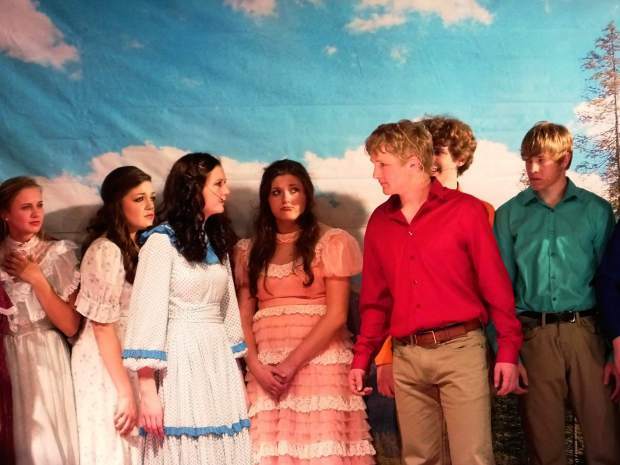 Performances for the Gordon High School musical were April 17-19, so now Cody is back to roping six nights a week. “Hopefully I can catch up,” he said. But he doesn’t really need to catch up, just maintain: he’s currently ranked third in the state tie-down roping rankings, and he and Wakefield are ranked first in the team roping. He is on the school’s honor roll and is a member of FFA. He is the son of Buddy and Stacey Darnell. The Nebraska State High School Finals Rodeo will be held in Hastings on June 18-19 at 10 am and 6 pm and at 1 pm on June 20. For more information, visit AdamsCountyFairgrounds.com or hsrodeo-nebraska.com, or call 402-462-3247.